From the experimental data of Rosenberg et al. 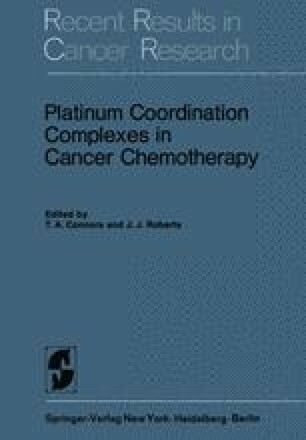 [3, 4] and others [1, 2] it is clear that various platinum complexes have good antitumour properties. Their primary action probably involves inhibition of DNA synthesis. At the National Ontological Institute in Budapest preclinical investigations of cis-platinum(II) diamminedichloride (PDD) have been carried out by Kellner, Nemeth and Somfai.